This is absolutely fantastic. The show doesn't take itself entirely too seriously and the characters are really likeable! It gives off an SOA impression but in my opinion has been started off with a much better stage for character development and improvement. I find myself actually wanting to see the characters level up and go on quests. This is going to be an amazing ride, so log on and get ready to grind...you wont be disappointed! Several people have been comparing this show to SAO, but it has more of a "Is it wrong to try to pick up girls in a dungeon" vibe IMO. Given how much I loved that anime, I'm looking forward to what this anime will bring. Definitely worth a few episodes at the very least. God has blessed me with this show. This is a definitely a neat show. I have only watched a few episodes so far (3) but I particularly adore them because I am a wizard and magic fanatic. This is a show that gives you an interesting world full of epicness and awe yet with characters who are very entertaining. It is nice to see a magic-genre show because there is so much potential creativity that can be put into it. However, it is difficult to find material like this nowadays. It is as if God came and threw this into my face--and I am thankful for it. I would absolutely recommend this show to friends. I hope season three will be in production soon because it is explosive--in a good way! RPG thats not cloning prior stuff so far . 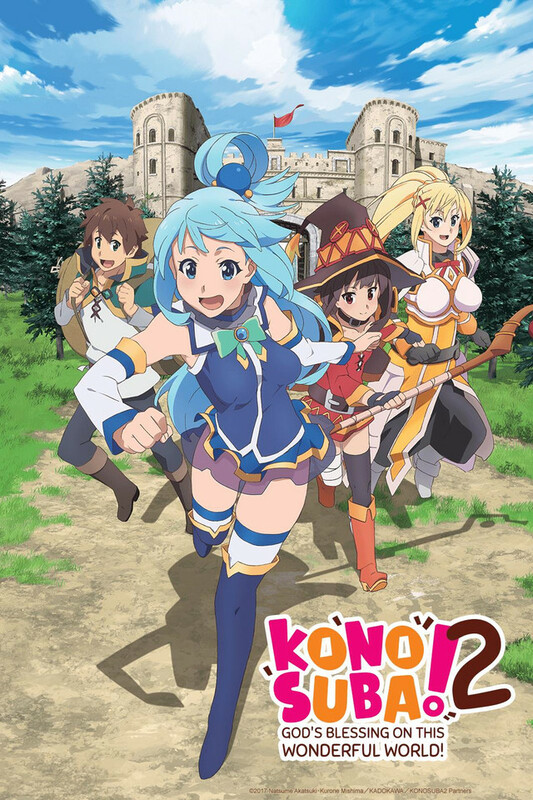 Im Updating my review after watching many episodes of this, by far this and gate are my favorite shows I look forward to every week, its set in an alternate world with rpg like characters, its more of a comedy than anything else but has some plot to it which is nice keeps it from going garbage, if you've seen a other rpg anime's you'll probably enjoy this a lot, personally after watching grimgar of fantasy and ashe for half season i wanted to shoot myself it was epic depressing, this is a good alternate to bring you back from watching that. Enjoy it for what is is. This show is really fun and it has very unique charm to it. Its based of a light novel series which topped Japans Light Novel sales last year. An impressive feat and there is good reason why. You finish many of the episodes with a huge grin on your face and that counts for a lot! Just watch it. Hilarious as heck. Alright, before you all start ripping on this title saying it's another sword art, YES it's Cliche, It ripped a bunch of stuff off other anime titles, and it even has a scene where they look exactly like Asuna and Kirito, BUT! its funny as hell and definitely worth watching. One of the few promising titles this season. Konosuba is a really interesting series, cause it has all the ingredients to be a typical generic LN adaptation (highschool protagonist, fantasy world, "harem-esque" cast), and yet it strikes a weird, wonderful balance between just that and greatness. First and foremost, Kazuma, the MC, is a total loser, even in the way he arrives in the fantasy world. Unlike your usual LN main character, he isnt cool, he isnt strong, and he certainly isnt charismatic or nice (well, hes nice sometimes but hes still a bit of a jerk). All of these traits make Kazuma a breath of fresh air concerning protagonists. I wont go too much into detail about the rest of the cast other than saying that their a bunch of idiots in the most endearing and fun way (like, literally according to the show they have low intelligence). This show is all around hilarious and endearing. Oh, also, its animated by studio Deen so naturally it doesnt have the best animation, however, dare I say, the janky animation adds to the greatness. At least give it a shot! It stands apart from the horde of terrible light novel trash. Refreshing with an Awesome Start! This review comes after watching the first two episodes. This has a somewhat cliched premise but takes it in a fresh direction for the genre. It appears to be set up as a harem (as evidenced by the poster and it's common in the genre), but thus far it's not overly sexual and all of the girls don't seem to be overly impressed by every kind or heroic thing our protagonist does. The show is heavy on comedy with very nice visuals and little action. The magic/special power sequences are really cool! There is a lot of variety in character design and so far, the characters have vastly different personalities that don't rely so much on tropes. While they have some novelty to them, they don't seem too over-the-top. Our goddess isn't a total mess up and has her own adjustments to make, which sets the story up for some nice character development all across the board. They do a good job of weaving in explanations about the way the world works without the overuse of long monologues and thus far, have a pace that is somewhat slow without crawling while remaining thoroughly entertaining. This is definitely one of my top five this season! I can't wait to see what this new mc is like next week! Very funny and enjoyable series. Come for the laughs. Not to take seriously. Speaking of not taking it seriously. You shouldn't expect fast pace plot arc either. The whole point of this show is that they don't really get anywhere and the party is mostly useless. THATS THE JOKE. Any review on here bagging on the show because the girls are stupid or the plot moves too slow/doesn't exists is completely missing the point of this show. The characters somewhat represent bad MMO players that level in foolish ways. For example a tank that cant hit anything, or a mage that levels ONLY explosion magic and cant move for 24 hours after 1 spell due to low mana pool. Anyway the whole point of this show is the characters are stupid. The struggle is funny AND THAT IS THE POINT. Probably not a very enjoyable show for most girls. But would probably make most any guy ROFL at many points.